4 Wheels & 4 Helping Paws: Henry's story - from abandoned dog to a doggy hero! Henry's story - from abandoned dog to a doggy hero! 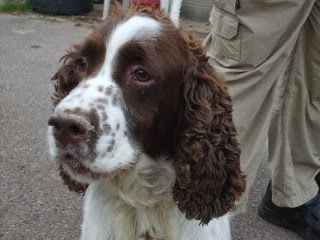 Henry is a rescued English Springer Spaniel who we adopted in the summer of 2008. Henry was abandoned by his previous owner, and was in very poor health. Little did I know how much this neglected, sad, scared dog would change my life. He was left in a house alone for several weeks while his owner worked at the other end of the country. His neighbours rightly complained about this, as he made alot of noise when food etc. ran out, so the next time he had to go away he put Henry in boarding kennels - and never came back to collect him. Henry was extremely underweight, had a matted urine stained coat, infected ears, sore skin and a sore nose. He was also suffering from a severe stomach virus, which he nearly died from. But worse than this was his mental health - he was scared of everything; hated doors closed in the house, was obsessed with food and couldn't be left alone. In 2004 I had a promising career as a trainee accountant and led a happy, normal life. Suddenly all normality ended when I came ill and had to leave my job. I was constantly exhausted, often had black-outs and was in huge amounts of pain all the time. Eventually I was diagnosed with ME, fibromyalgia (a condition which causes severe muscle and joint pain) and diabetes. As months became years I lost all hope of getting my life back and fell into a deep impression. I cut myself off from my friends and refused to leave the house unless accompanied by my mum or brother; even then I often made excuses not to go. My life had become restricted to my bedroom, living room and hospital appointments. I suffered panic attacks at the thought of having to see or speak to anyone, and would hide in my room if even close family visited. It had come to the point where I seriously thought that my life wasn’t worth living and thought of ending it all. Then Henry entered my life and everything changed. I saw in Henry’s eyes some of the anxiety and fear that I also felt, he too had also lost his former life and was afraid what the future held. We bonded instantly and I vowed to help him overcome his poor health. Henry gave me a purpose to keep going, and saved me from a world of dark depression and saved my life. Gradually Henry’s health improved and he became a happy and healthy dog. I was proud of him and what he’d overcome. Over the next few months Henry helped me when I was feeling low, and even managed to calm me down when I had panic attacks my nudging my hand and making me stroke him so I focused my attention on him. I was proud of my handsome dog and started to take him out for walks using my mobility scooter. If people came to talk to me I was happy to tell them all about my amazing dog, and didn’t feel the need to rush away. I didn’t think it was possible for Henry to help me any more than he already did, but boy was I wrong. I often collapsed when my blood sugars went low and mum noticed he acted very strangely before these happened. Eventually we realised then Henry was letting me know when my blood sugars were dropping my sniffing my breath and licking my face. We tested my sugars and he’s right every time. When he gives me this warning he gives me time to eat a glucose tablet to raise my sugars so that a diabetic hypo is prevented. This has saved me several times over the last year. Then in august of 2010 I was asleep on the sofa unwell, mum assumed it was my normal ill health and let me sleep off the pain. Then Henry acted very strangely pulling her over to me, barking and pawing at me. Mum came to check me and realised I was burning up unconscious. It turned out I had septicaemia and was in hospital for a week. I had an operation to remove some infected tissue from my leg. It was very serious, and if it wasn’t for Henry I wouldn’t be here now, he saved my life. My father passed away on November 11th 2011, and Henry has helped both myself and my mother cope with this. When we’re crying, he cuddles into us. When we’re feeling sad, he makes us laugh by throwing his toys at us. He has been a great comfort. 18 months ago we adopted Jessie, a mastiff cross who suffered severe abuse. Henry helped her to learn to trust humans, if it wasn’t for Henry I don’t think Jessie would have recovered so well. Henry is such a special dog, he's my hero. A moving story. All the best to you both! 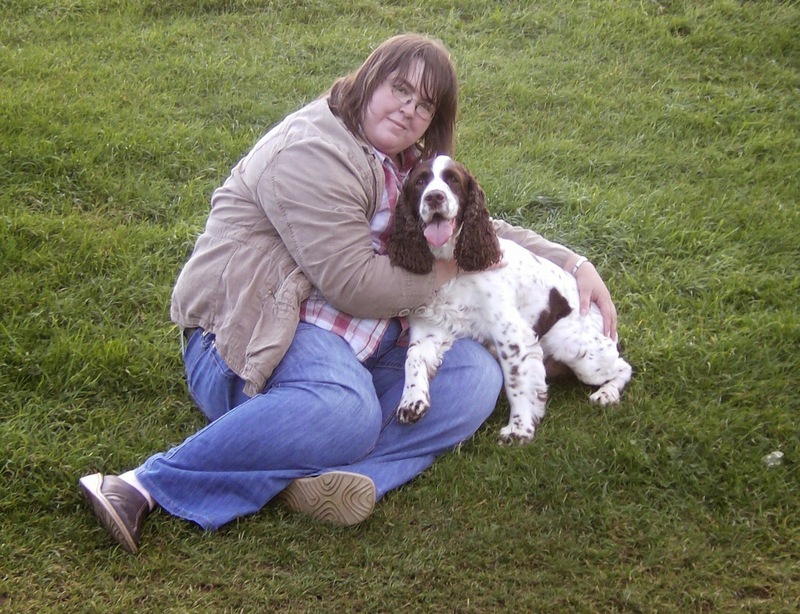 Jessie's story - abused dog makes it to Crufts! Can you offer Devon his forever home?